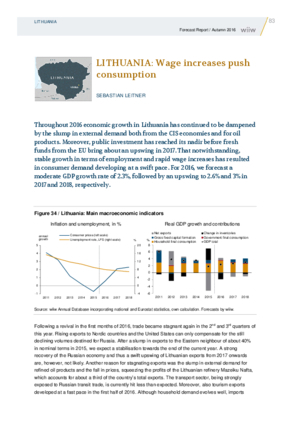 Throughout 2016 economic growth in Lithuania has continued to be dampened by the slump in external demand both from the CIS economies and for oil products. Moreover, public investment has reached its nadir before fresh funds from the EU bring about an upswing in 2017. That notwithstanding, stable growth in terms of employment and rapid wage increases has resulted in consumer demand developing at a swift pace. For 2016, we forecast a moderate GDP growth rate of 2.3%, followed by an upswing to 2.6% and 3% in 2017 and 2018, respectively.